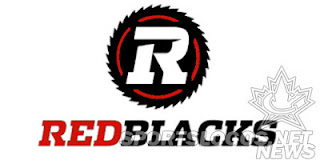 "The worst-kept secret in Canadian football doesn't need to be kept any more, as the Ottawa expansion franchise set to start play in 2014 officially announced that they'd chosen "RedBlacks" (and "Rouge et Noir" in French) as their name at an unveiling ceremony Saturday. RedBlacks had been the leading candidate for the new team's name since at least January, and it was reportedly firmly chosen in April, so there wasn't a lot of suspense here. The various logo leaks (including that of the final logo the team chose, which appeared online at the end of May) meant that part wasn't particularly suspenseful either. However, the Ottawa ownership group was still able to put on an impressive event, and they received strong support from the fans in attendance. They also showed they're cognizant of the importance of recognizing the history of Canadian football in Ottawa, and that's going to be crucial to this franchise's success over the long run."